Delmatic systems transform physical lighting installations into virtual networks, managed and monitored through powerful graphical software. 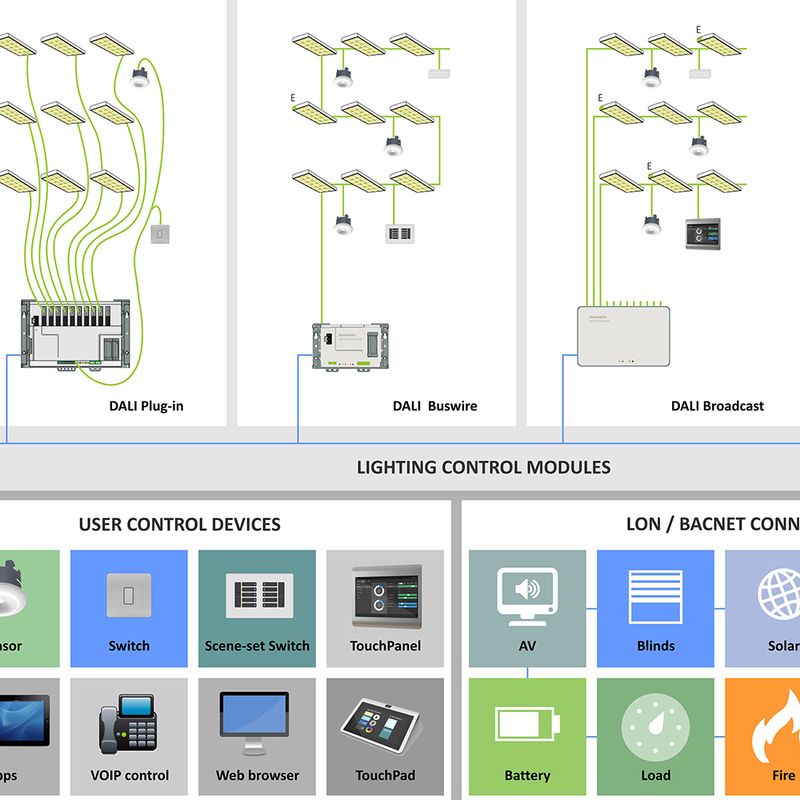 The system architecture is based upon a logical, modular network comprising lighting control modules, local control devices, network PC and routers. Delmatic offer the widest range of open-protocol modules to provide every degree of flexibility – from circuit control to individual lamps control; to control every type of light source – including DALI, DMX, 1-10V and switched; and to suit every type of installation – plug-in, hard-wired and flexible conduit. Delmatic empower individuals with control of their lighting environment through a variety of mix-and-match local control devices including absence detectors, presence detectors, photocells and multisensors; switches, switch interfaces and scene-set panels; latest touchpads and touchpanels; as well as IP phones, web-browser and App controls. Systems are centrally monitored and managed through advanced software running on a network or virtual server. Virtual-wiring routines and drag-and-drop tools adapt lighting configurations in real time, instantly revising control arrangements to match changes in space planning and zoning, while interactive project graphics display active information on lighting and system operation. Routers optimise data transmission across the building and/or IT network enabling communication of critical data to mobile and WAP devices. Delmatic’s open protocol neighbourhood represents a network where any LON or BACnet building services device can instantly connect for seamless, interoperable control as well as full TCP/IP connectivity.